The last post on VHDL/FPGA presented a naive implementation of a 74*373 latch and went as far as adding a little timing information to make the behavioural simulation a little more realistic. The post also hinted at the fact that there are some free VHDL libraries out on the net. This post uses a part from one of these libraries and shows how to add more accurate timing information to the behavioural simulation. 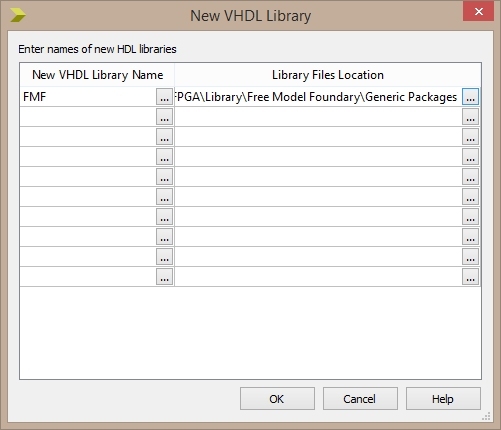 The Free Model Foundry is an open source repository of VHDL and Verilog models. The models are freely available and the majority of the models are provided with timing information. The 74xxxx series of chips can be located in the STD series of models. 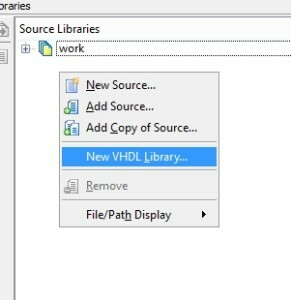 A quick check reveals that the library contains a 74*373 behavioural model in the file std373.vhd. So let’s create a project and check out this model. Now give the project a name. 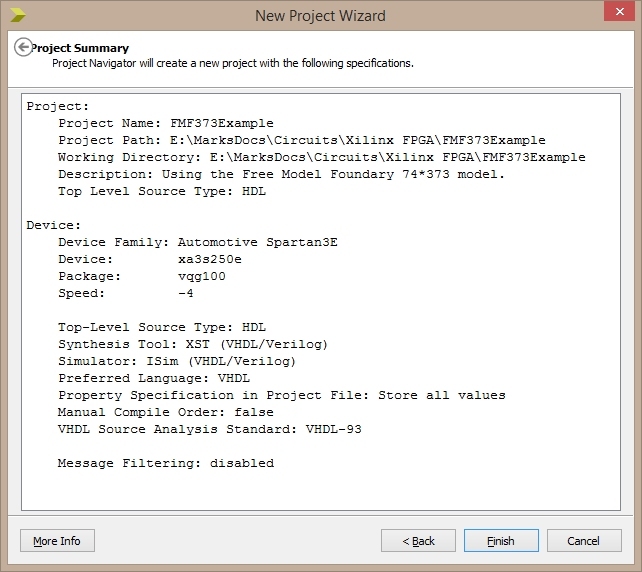 I selected FMF373Example, gave the project a short description and set the Top Level Source TYpe to HDL. The next step is to add the model to the empty project we have just created. 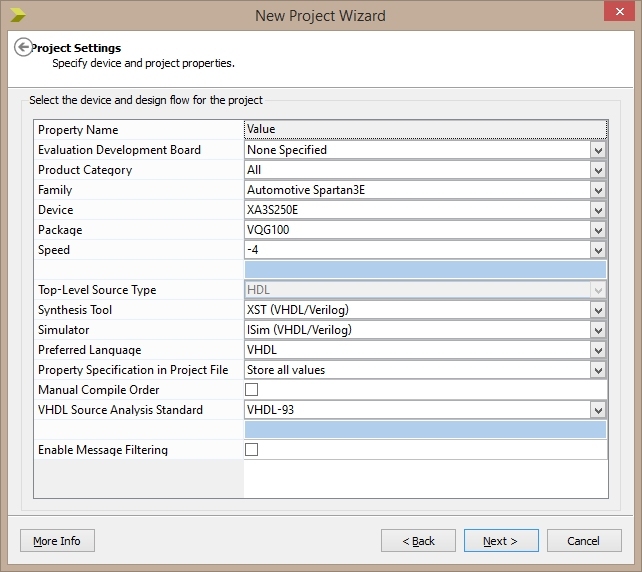 Right click on the project and select Add Copy of Source…. 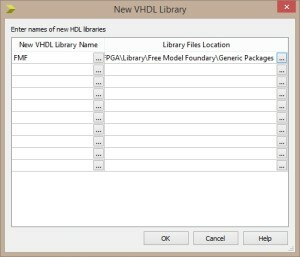 Now navigate to the directory containing the VHDL source files for the FMF models and select the file std373.vhd. 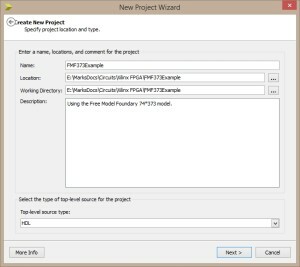 This will copy the file from the directory containing the original model files and place a new copy in the project directory. 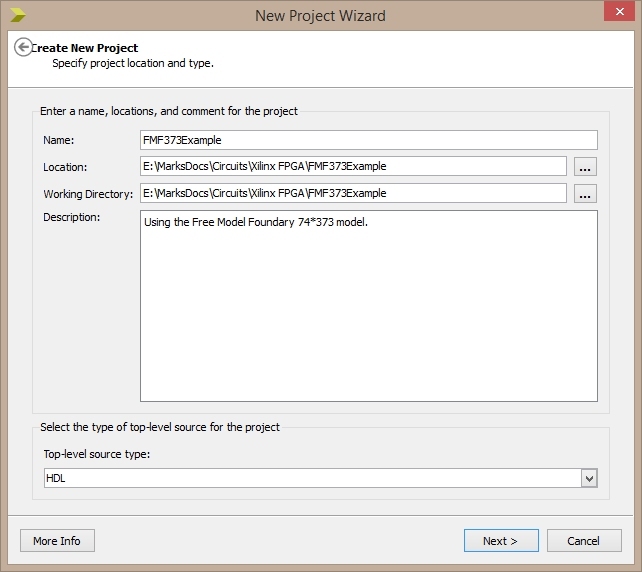 Opening the source file for this model shows that the Free Model Foundry implementation is vastly more complex than the model presented in the previous post. 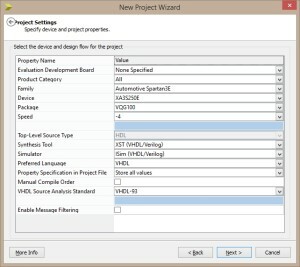 Close the simulator and return to the ISE Project Navigator. ERROR:HDLParsers:3014 – “E:/MarksDocs/Circuits/Xilinx FPGA/Library/Free Model Foundary/Generic Packages/gen_utils.vhd” Line 23. Library unit VITAL_primitives is not available in library IEEE. --  Provide an 8 MHz reference clock signal. --  Initial condition, latch should have stabilised and be high impedance. We will now have a closer look at the code and examine why this happens. One of the first things to note about the STD373 implementation is that this file only contains a behavioural model for a single latch. The 74*373 is actually an octal transparent latch where each latch has it’s own distinct data input and out put lines but all share a common latch enable and output enable line. eight of these latches are required in order to simulate a single 74*373 chip. The second pint is that this file contains the abstracted behavioural model for a latch only. This does not include any additional implementation code for a synthesis-able model. This declaration details the port specifications for the model along with the timing information. The port specification tells us that this model has only three inputs and one output and that these are of type std_logic. This tells us that this is a single latch as all of the ports are single signals. The upper section of the declaration contains the timing information. This information is used throughout the model and these values influence the timing of the signals in the simulation. Remember the 1 ns delay in the above trace. This comes from the UnitDelay01 delays set in this timing block. The key to the problem for me was the comment block at the bottom of the block as this gives examples of how to use the types. 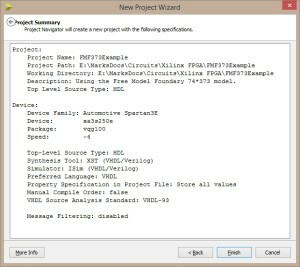 Some of the Free Model Foundry libraries contain timing information along with some tools detailing how the timing information can be used. At the moment I have been unable to work out how to use these tools and the timing information. What I believe I have been able to do is to take the timing information in the data sheet for the 74HC373 and combine this with the model to adjust the behaviour of the code above. Here’s how I did it. A little thought lead me to believe that the types are symbolic names for the transitions of the digital signals. So tr01 represents the transition from 0 to 1, tr0z represents a transition from 0 to high impedance etc. This line of code defines a type containing two time elements. I believe that these represent the time delays for signals changing from 01 to 1 and also from 1 to 0. The trace shows that there is a delay between the data appearing on the data input and the same data appearing on the output pin. 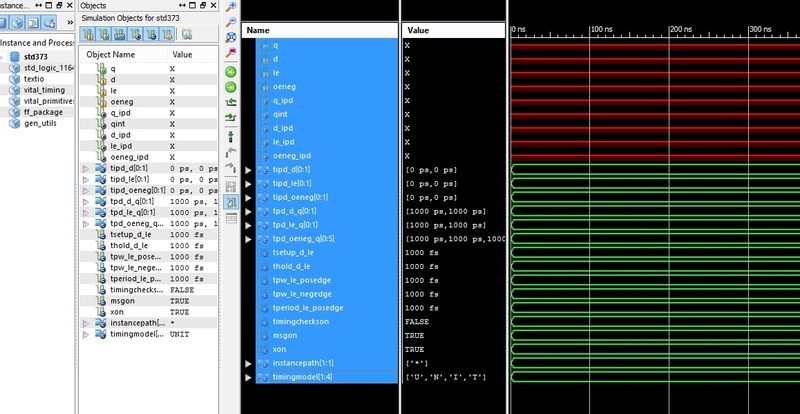 This appears to simulate the expected behaviour of a single latch using the timing parameters from the data sheet. I am sure that there is a much better way to use timing information and further research is required into the simulation tools and the data from the models. 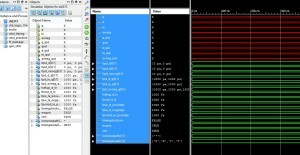 The techniques presented here allow the use of the timing information from the data sheet in order to simulate the behaviour of the desired component. This post was challenging to write as there is very little information easily available on the IEEE VITAL library. Even Google was of little help in this area. 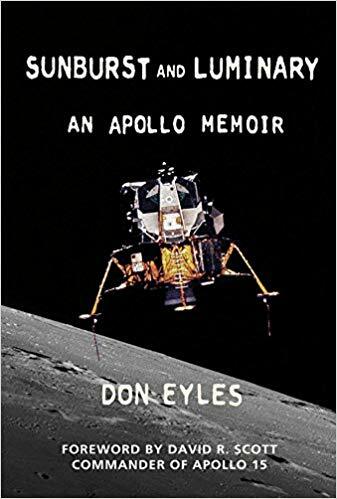 I have presented my understanding of the topic from the little information I was able to obtain. Looking at the results in the simulator it does appear that this technique is valid even if it is a little long winded. Hopefully I will find a way of using this information in a more efficient method once I am more familiar with the tools. Next steps, combine eight of these to form a 74*373 latch and more research into the tools. Saturday, December 28th, 2013 at 11:46 am • Electronics, FPGA • RSS 2.0 feed Both comments and pings are currently closed.